Every now and then a cleaning product comes available that has a tremendous impact on our industry and the way we do business. We found a product that we think highly enough that we wanted to bring it to your attention. The cleaning product is called Endex 99. 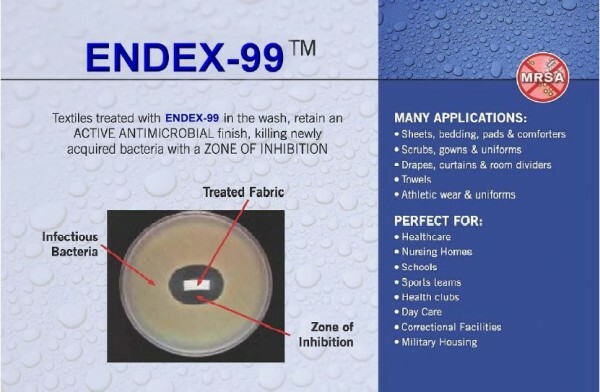 We learned about Endex 99 through our relationship with Vapor Cleaners that we contract with to wash our reusable cloth rags. It is classified as a self-sanitizing finish. Simply translated, the product remains on the surface of the cleaning rags for several days, ensuring its cleanliness for use… and even after its use. As a company, we spend tons of time and money to follow OSHA standards, getting the wash cycle up to 190 degrees and above then maintaining that temperature, all the detergents, enzymes, de-greasers…but once that door is opened and a worker sneezes (mentioned for effect) it’s all for nothing! The product is injected in the final rinse and remains on the fabric for up to 3 days killing 99.99% of germs it comes in contact with. We have found by using this product, in addition to good and hygienic laundering practices, that we are significantly reducing the chance of cross-contamination. Used in the final rinse, sanitizers and bacteriostatic fabric softeners go beyond producing clean textiles. These products bond to the fabric a layer of bacteria inhibiting quaternary ammonium compounds. The active ingredients in our sanitizer continue to kill bacteria and odors while helping to prevent cross contamination throughout the use, collection, soil sorting and rewashing of the textiles. Bleach stops working once the textiles are removed from the wash. Bacteriostatic finishing insures that textiles are not only clean when they leave your plant; they are clean when your customer puts them into service. These products offer a unique type of protection to workers who handle contaminated linens, as well as to the users of the textiles.And as always… the product coincides with our Green and eco-friendly mission. Santa Cruz City Hall is getting an overhaul and we’re part of the cleanup crew! Sunrise cleaning service was asked to assist with the cleanup of this historic building. We’ll be wiping everything down and helping them get ready for a much needed update. They’ll be bringing in sleek big screen TVs and other electronics to help make meetings more productive. The offices of the City Clerk, City Manager and City Council are located in downtown Santa Cruz’s City Hall. The architecture and gardens with multiple fountains are reminiscent of Santa Cruz’s early days as a mission. Cleaning this type of building takes special care, due to its age and the specialty woods used in the chambers. Sunrise Cleaning series is equipped for this type of job because it uses environmentally friendly cleaning products and has experience working with this type of wood. We are thrilled to be a part of the City Hall cleanup. We take pride in all of our work and look forward to helping make the old City Hall look like new! Do you clean up for your Cleaning Service? Sunrise Cleaning Service uses only the safest, non-toxic, environmentally conscious products available today. All of our employees are extensively trained. We are a bonded and insured company. We serve Santa Cruz, Aptos, Soquel, Capitola, Live Oak, Seascape, Watsonville, Scotts Valley, and the surrounding cities within the Monterey Bay.